After three years of steady improvement, Can-Am was now blooming into one of the world's leading championships. Both Lola and Chevron produced new ground-effect Can-Am cars although Chevron's didn't race after disappointing test results. Patrick Tambay returned to Can-Am to drive a new Lola T530 for Carl Haas but he found the competition much tougher this time. VDS were Lola's leading customer team again with Geoff Brabham now in the driving seat and the Australian regularly outqualified Tambay in the latter half of the season. Newman Racing had given up their Spyders and also bought new T530s for Elliot Forbes-Robinson and Stephen South, and Garvin Brown Racing had yet another T530 for Danny Sullivan. Competing with the Lolas were Al Holbert, now in his own team and driving a new Lee Dykstra-designed CAC-1 to two victories; Bobby Rahal driving U.S. 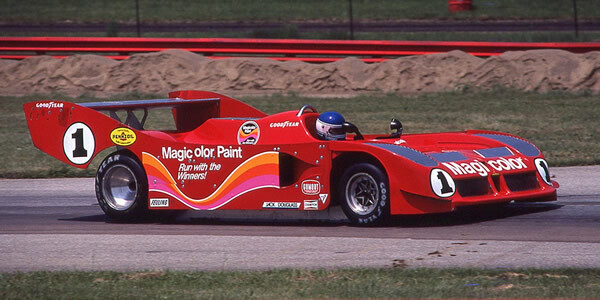 Racing's new and supposedly ground-effect Prophet; and John Morton who had joined forces with Brad Frisselle Racing to drive their Lola T332-based Frissbee. After a couple of promising outings, Al Unser took over the Frissbee for Laguna Seca and blew away the opposition. These race results were compiled in a joint project between Martin Krejcí and Allen Brown in the late 1990s using Formula , Racecar , On Track and the SCCA's Sports Car magazines as main sources. Car identities were worked out from Allen's ongoing F5000 research and Martin's ongoing sports car racing research and we are grateful to many former competitors and spectators for their help with this. An extensive search for program entry lists, both on eBay and from a range of contributors, has provided further information. A total of 22 programs are still sought.